All our investor leads have gone through a pre-qualification process which means that all the following information has been verified by phone within the past 45 days. All the above information is 100% guaranteed!! All of our investor leads are fresh, current and come with a 100% satisfaction guarantee for quality and accuracy. 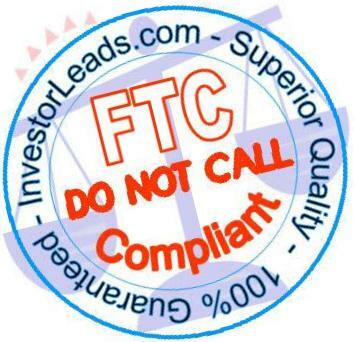 All investor leads are FTC-compliant and have been scrubbed against the national FTC do-not-call list. (Please ask about FTC DNC requirements. You may need a SAN - Subscription Authorization Number). We receive new investor names monthly and give a 180-day exclusive on each lead. We guarantee 100% that the sales leads are clean and "unhammered". As a small company with low overhead, we are able to provide you with highly-qualified investors at very competitive prices. If you find a lower price, please let us know. We will beat any advertised price, just ask! Selects (such as city, zip, scf, area codes, counties) add 3 cents per record. Please note that on these special orders, minimum order is 2000 records. Below are some of the formats available. If you need something specific, contact us. We can provide any format needed. You can receive your leads within 1 hour via email. Typical file formats are Adobe Acrobat (12 or 24 records per page, .pdf), Microsoft Excel (.xls), ASCII comma delimited (.cvs or .txt). Click each underlined format to see a sample. contact us for any other format. We can E-mail your leads to you immediately, receive your leads within 1 hour, no shipping charges (for special orders delivery time may vary). Since 1987 we have been providing the financial industry (ie. stock brokers, financial advisors, private placement brokers, oil & gas and commodity brokers) fresh pre-qualifed leads at the absolute most competitive pricing. Check out the competition. Before ordering from them, do yourself and your company a favor, CALL US ! No one beats our knowledge of the industry, our service or our price. We guarantee it!